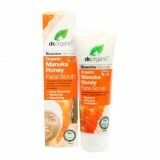 Dr.Organic utilises only the finest natural and organic raw materials wherever possible. We source a wide variety of accredited and certified organic ingredients from around the World including; Organic Aloe Vera, this replaces the majority of water in products that are not oil based; A variety of Organic plant oils, butters and extracts are used throughout the product range. Emulsifiers, emollients and preservatives permitted by Organic Cosmetics Standard are also ordinarily used in our products. Wherever an organic ingredient cannot be utilised a sustainable natural or naturally derived alternative is used. A light and absorbent body cream, formulated to revitalise and smooth the skin. It instantly hydrates and nourishes the skin, leaving it perfectly moisturised and supple. Price: R179 Availability: Online at www.kalahari.com. An exceptionally deep cleansing, repairing exfoliant that removes impurities and excess oil whilst restoring, nourishing and moisturising the skin to give a radiant youthful glow. Price: R169 Availability: Online at www.kalahari.com.